The Nights of Lights Lighting Ceremony, also known as Light Up! Night, takes place on Saturday, November 23, 2019. Locals and vacationers from all over join together to watch the City of St. Augustine flip the switch on three million white lights decorating the Plaza and buildings all over historic downtown. Leading up to the occasion is a free concert and a countdown, and the ceremony is followed by more live music. This has been a popular annual tradition in St. Augustine for over 20 years, and is all the more festive now that the Nights of Lights has garnered worldwide attention as a top destination to see holiday lights. The information below reflects the 2018-19 Light Up! Night festivities. Details for the 2019-20 Light Up! Night will be updated as soon as more information is available. The event opens with a live performance at 4:00 p.m. outside the Lightner Museum, followed by a rousing concert by the All Star Orchestra at the city's Plaza de la Constitución at 5:30 p.m. At 6:30 p.m., the countdown for the lighting begins. After the lighting, the band will play again until 8:00 p.m. The large Christmas tree in the Plaza will also be turned on so visitors can get photos for their holiday Christmas cards. Every year, the City of St. Augustine chooses someone in the community to light the tree. This season, the honor goes to Miss Carrie Johnson, a Lincolnville native and graduate of Excelsior High School. For many years, Miss Carrie led an annual holiday caroling event in the city during Nights of Lights. As Mayor Nancy Shaver remarks: "One would be hard pressed to find a better example of real, honest joy than Miss Carrie's radiant smile and cheerful greetings that always improve the day for anyone she meets." There is no designated parking. Meter parking is free after 5:00 p.m. Pay-to-park lots are available downtown. The Historic Downtown Parking Facility charges $15 per car for all-day parking, but handicapped parking is free. Below is the information about the 2018-19 Park & Ride Shuttle for Nights of Lights. Information about the 2019-20 Park & Ride Shuttle for Nights of Lights will be updated as soon as details are available. The City of St. Augustine provides a free park and ride shuttle service on the busiest dates in November and December for visitors who have come to see the lights. The shuttle operates from 1:00 to 11:00 p.m. with pick-ups approximately every 20 minutes. The shuttle service begins on Light-Up! Night, and will continue on Friday and Saturday of Thanksgiving Weekend (November 23 and 24) and then every Saturday in December (December 1, 8, 15, 22, and 29, 2018). • Parking Lot at the northern end of San Marco Ave, 301 San Marco Ave.
On Light-Up Night (November 17, 2018) ONLY, the Anastasia Island shuttle will run from 4:00 to 11:00 p.m., from the following locations to the east end of the Bridge of Lions.On Light-Up! Night (November 17) ONLY from 4:00 p.m. to 11:00 p.m.
R.B. Hunt Elementary, 125 Magnolia Dr.
For details and maps of the shuttle service, please visit here. When: Saturday, November 23, 2019, 4:00 – 8:00 p.m.
Where: The Plaza de la Constitución on King Street in historic downtown St. Augustine. For more information, check out our 7 Ways to See the Nights of Lights. 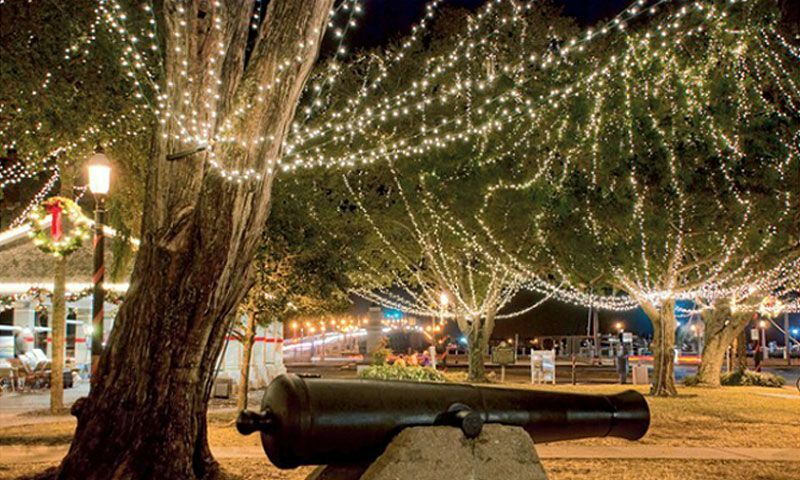 For information on Nights of Lights in St. Augustine, check out our full event profile.